I was sorry to hear that Steve Gerber, one of my favourite comic book writers, passed away on Sunday. Gerber was best known as the creator of Marvel Comics’ Howard the Duck. Forget the atrocious George Lucas-produced 80s movie adaptation, Gerber’s HTD was the real deal: a cynical, cigar-chomping, anarchistic antidote to the traditional funny-animal strip. Although I read it at as a kid, Gerber’s HTD – with its strong vein of subversive satire and narrative experimentation – had a lasting impact on my sensibilities. 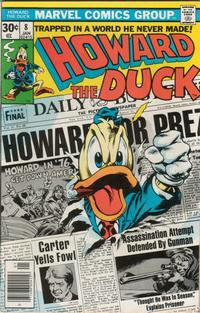 At one stage, The Walt Disney Company famously threatened to take Marvel Comics to court, claiming that HTD infringed on their Donald Duck copyright. 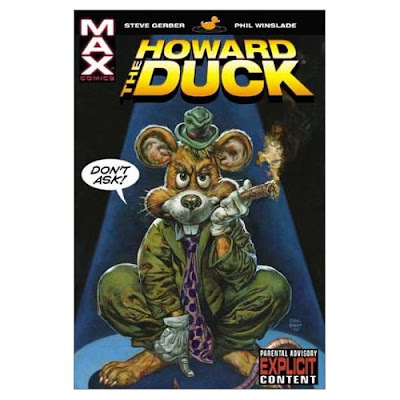 In 2001 Gerber returned to the character, producing a more explicit version of the strip for Marvel’s adult-orientated ‘Max’ imprint. In this story – and for reasons too ludicrous to explain – Howard finds himself transformed into an cynical, ugly, cigar-chomping rodent.